It seems like Floyd Mayweather just got a Christmas gift that best suits his personality. Revealing his Christmas present to his fans, the 38 year-old American retired boxer took to his Instagram page to write,"I want to thank my family @themoneyteamrussia here in Moscow, Russia for the hospitality & my early Christmas present, a rare & exotic tiger from India. Any suggestions for a name for this two-month old, female tiger? #Moscow #Russia." In the picture, the boxer was seen sitting with a tiger. 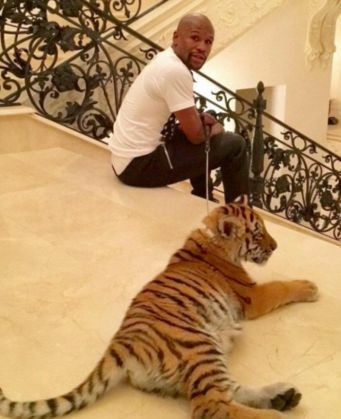 Notably, Mayweather isn't the only athlete to have an unusual pet. Earlier, American football wide receiver Dez Bryant adopted a baby monkey in October and named it Dallas.